With its roots in 1930s blues, the Knickerbocker still rocks with live R and B, soul and Motown music. Photography by Chris Vaccaro. According to Merriam-Webster, “Knickerbocker” is an old-school nickname for a New Yorker, or, more specifically, a descendant of New York’s early Dutch settlers (supposedly because they were known to wear loose, short trousers called “knickers”). So how, pray tell, did such a designation become the name of a beloved blues institution in downtown Westerly? On a sunny June afternoon, Mark Connolly, executive director of the Knickerbocker Music Center, meets me on Westerly’s Railroad Avenue underneath the club’s iconic neon sign. Instead of heading inside, however, he beckons me to follow him to the left side of the building. As I turn the corner, I see that it is emblazoned with a magnificent, sprawling silhouette-style mural. The Knickerbocker (or “the Knick,” as frequenters call it) was one of the lucky few to receive the artists’ treatment. The original idea was to depict famous acts that have headlined, including the likes of Leon Russell and Eric Burdon and the Animals, but Connolly wanted to also highlight the club’s rich history. The mural illustrates the station and the train (which cleverly uses piano keys as tracks), as well as the outline of a man holding a guitar case. Connolly tells me that many musicians en route to New York or Boston often found their way to the Knickerbocker’s bar and stage when its namesake stopped in Westerly for the night. This launched the club’s destiny of becoming a reputable live entertainment venue. In the years that followed, the club saw considerable success, but it really hit its heyday in the ’70s when a ragtag group of Westerly-based high schoolers came together and formed a band called Roomful of Blues. Their talents gained a decent following in their hometown, but a fateful trip to Chicago, where blues music was in full swing, changed their sound for the better. Every time Roomful of Blues had a show scheduled at the Knickerbocker, the place sold out. The boys even became a national act, going on to appear on the “Ed Sullivan Show” and touring the country. When they played in Austin, Texas, the band ran into and befriended Stevie Ray Vaughan. Roomful of Blues told Vaughan all about a great little music club back home where they got their start, and so, when Vaughan (and even his brother, Jimmie) and his band were in town, they made sure to add the Knickerbocker to their lineup. Top, left to right: One of the Walldogs’ masterpieces adorns the side of the building that houses Savoy Bookshop and Cafe; the historical United Theatre is poised to play a large part in Westerly’s cultural renaissance; Andrew Vitor plays a set in the Knickerbocker’s taproom. Bottom, left to right: Patrons grab a few craft drinks while listening to a live performance in the Knickerbocker’s taproom; as the marquee states, rock and roll never dies at the Knickerbocker; the Knickerbocker’s one-of-a-kind exterior mural. Photography by Chris Vaccaro. Vaughan has his place on the mural, depicted by a too-cool-for-school figure leaning against an illustration of a Marshall amp. To his right, a four-piece band plays the trombone, cello, trumpet and drums as they ascend a piano key staircase. To me, the eternally performing figures represent Roomful of Blues and their game-changing music. But, like most, the Knickerbocker’s story is not without its upheavals. After the devastating Station Nightclub fire in 2003, the state came down hard on all venues with a capacity of 100 or higher. To stay open, everything had to be 100 percent up to code, but the original owners found the new expenses to be too great. The Knickerbocker closed for a year. And then, along came Connolly. With Connolly came some big changes for the historic club. For one, its interior received a bit of a makeover. 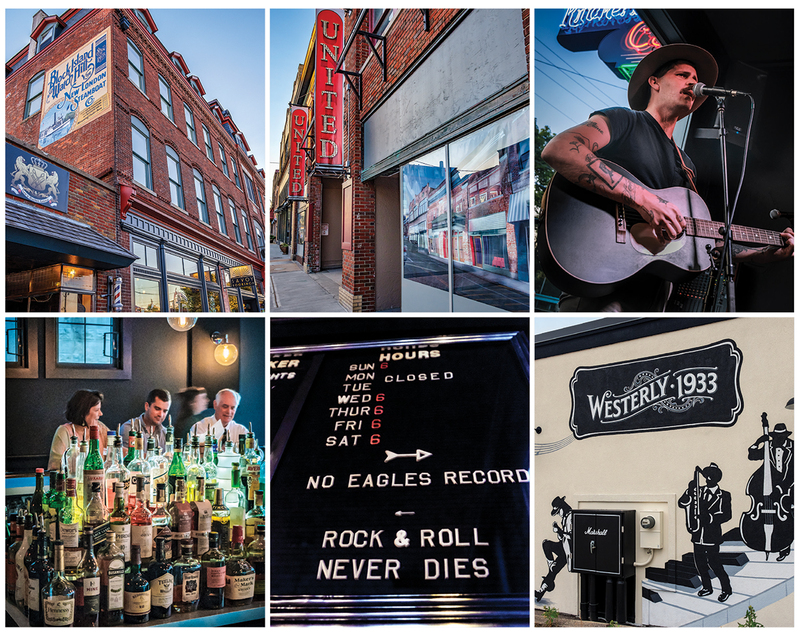 We enter the venue and, even in the middle of the day, it’s easy to see that Connolly has been able to pull off the right vibe with moody lighting, sleek bar setups and dark walls bedecked in photos of blues legends. In the back, there’s a giant stage set behind an even bigger dance floor, which is original to the club. “We like to promote a lot of dancing — and not just during performances. On Wednesday nights we have a dance instructor teach East Coast swing, which everyone likes to breakout during rhythm and blues songs,” Connolly says. But these walls no longer only bear witness to tried-and-true blues acts like Al Copley and Roomful of Blues’s Duke Robillard, but contemporary ones as well. When Connolly shows me a basement wall full of musicians that have blown through, I recognize posters for everyone from Deer Tick to Dust Bowl Revival to Josiah Johnson (of the Head and the Heart fame). The Knickerbocker also draws in a younger crowd with its adjacent taproom. A door separates it from the main room, opening up to a hipster’s paradise accented by pendant lighting, records doubling as decor, a full bar stocked with six revolving drafts and ingredients for a whole slew of delicious craft cocktails, and an intimate corner stage area that’s ideal for smaller acoustic acts. The most important change of all, however, came in March of 2015 when the Knickerbocker Cafe converted to the Knickerbocker Music Center, a nonprofit organization formed in partnership with the Rhode Island Philharmonic Orchestra and Music School. Just around the block from the Knickerbocker, the once-mothballed United Theatre building (which was a go-to destination for film lovers from 1926 to 1986) and its next-door neighbor, the Montgomery Ward building, are currently undergoing renovations to become one large cultural complex on Canal Street. The plan is to build a Knickerbocker Music School within the complex and, once completed, its aim will be to foster the musical talents of people of all ages. And there are even more plans in the works. It’s clear that Westerly is experiencing quite the renaissance — perhaps even giving our creative capital a run for its money — and that the cool, historic venue with a strange yet delightfully fun-to-say name is at the helm. As I leave, the Knick’s blue neon sign burns bright overhead, a shining beacon welcoming all creative souls to venture south and enjoy the music.